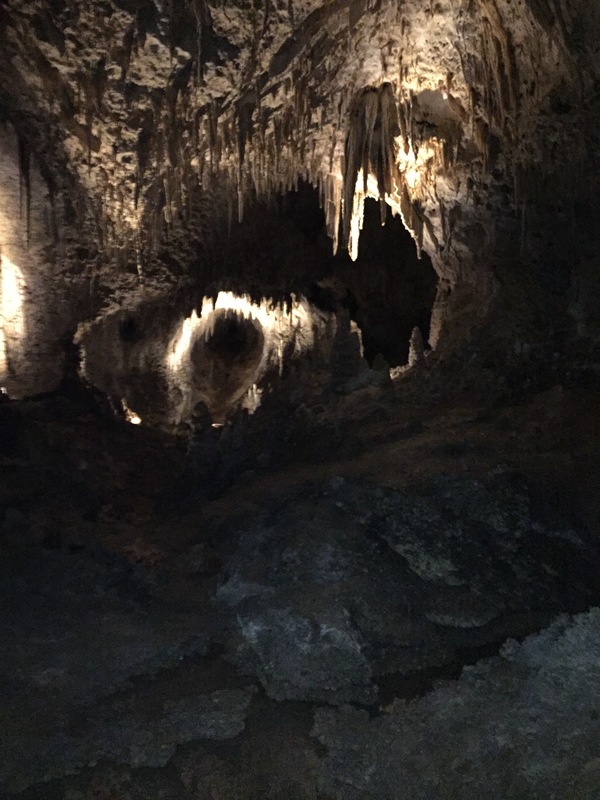 Yesterday we visited the Carlsbad Caverns National Park. It’s located in a remote area near the southern border of New Mexico, so it takes an effort to get there. 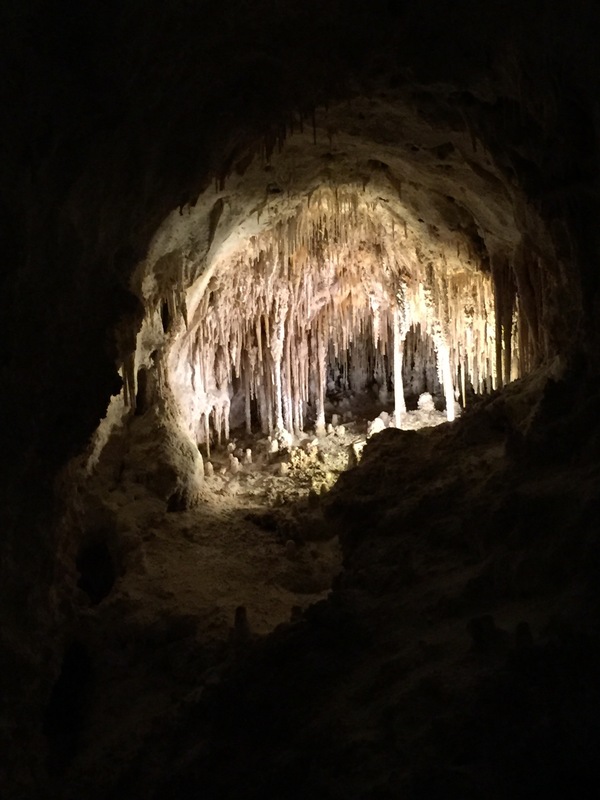 We made a five-hour drive from Santa Fe to reach it — but it was definitely worth it. 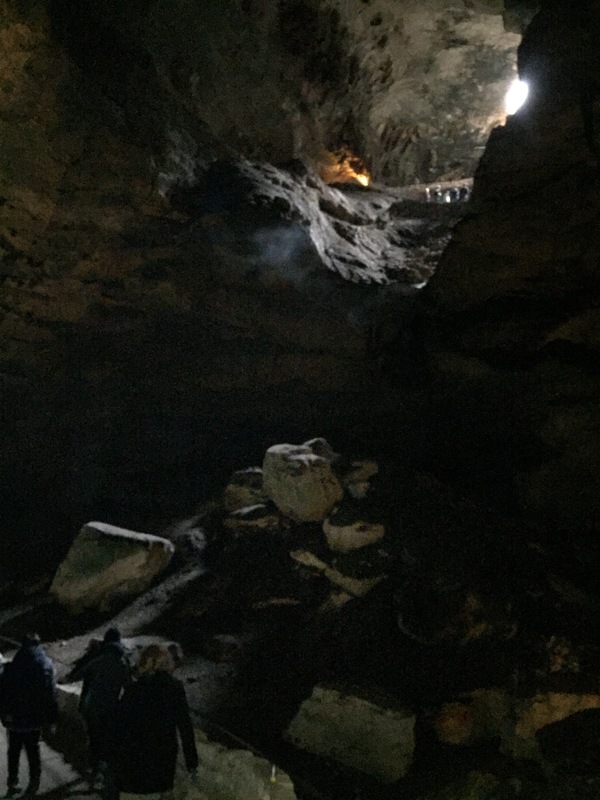 We took the natural entrance to the cave, which requires you to walk down a steep series of switchbacks and drop hundreds of feet into the mouth of the cave. (It’s easily doable, but if you’re queasy about heights, be sure to stick to the inside of the switchbacks.) 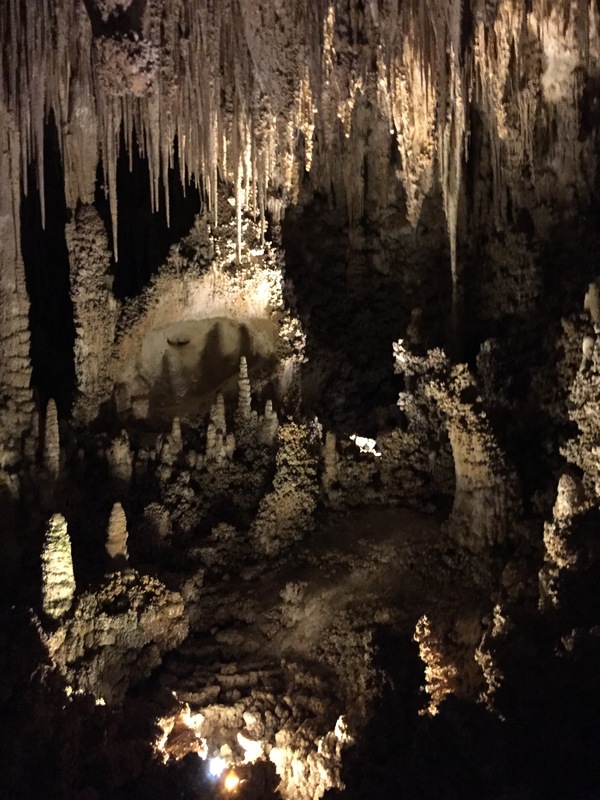 Once you leave the last rays of natural light, in the area shown above, you find yourself in a dimly lit fantasy land of astonishing rock formations ranging from the delicate, like the Doll’s Theater shown at the top of this post, to massive stalactites and stalagmites. And when you reach the Big Room, a colossal underground opening where the fabulous creations of nature are found around every corner, be prepared to spend some time just shaking your head in wonderment at it all. Words can’t begin to describe it, and photos taken with a cell phone can’t really begin to capture the scale and intricacy and vastness of it all. I’ve posted some photos merely to give an idea of what you’ll see on a visit, but understand that they convey only a tiny fraction of what it is like to be there. And, after a time, a certain hush seems to fall over it all. Even rambunctious kids begin to talk in whispers as they walking along the path, and there’s not much need for shushing rangers, either. 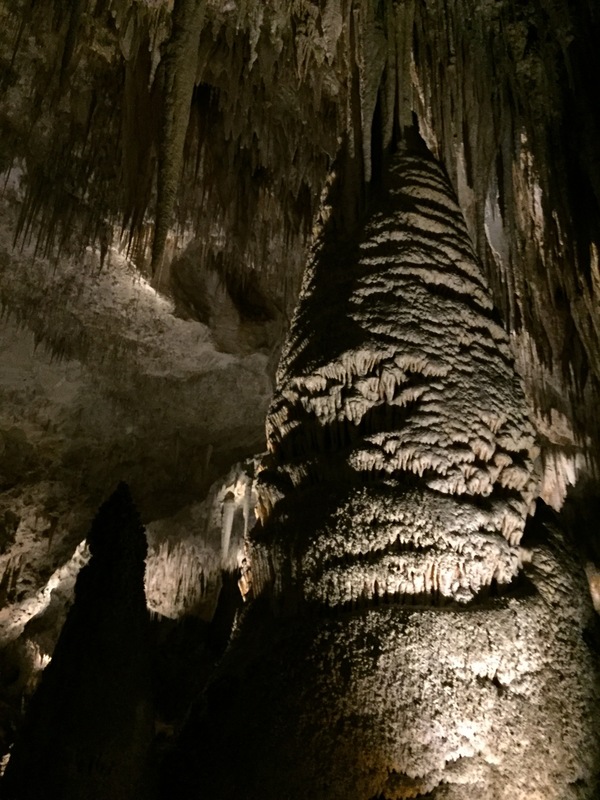 Standing in the cool dimness — the Caverns maintain a constant temperature in the 50s– with the vaulted ceiling far above, and towering statuary-like figures everywhere you look, the experience is like being in a gothic cathedral . . . and who is loud in a church? 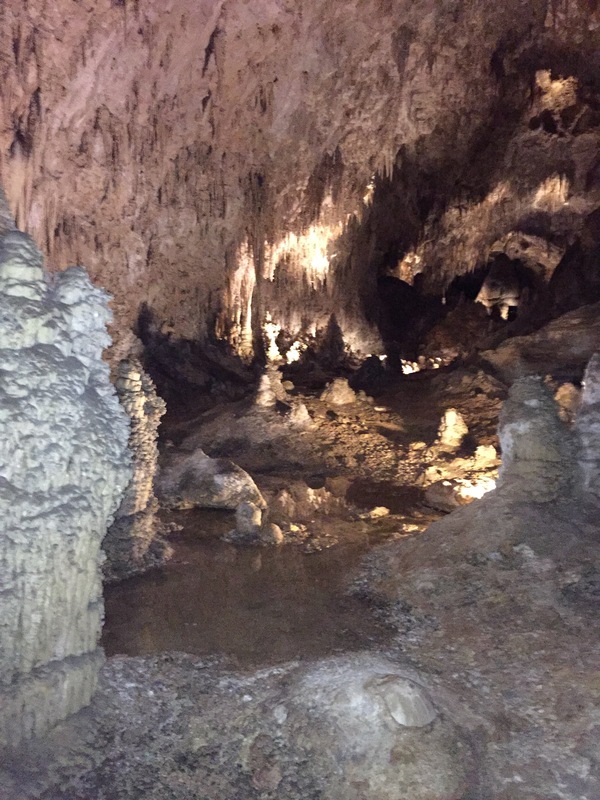 The Carlsbad Caverns are a world heritage site, drawing visitors from across the globe, and it’s not hard to see why. It’s got to be one of the most spectacular bits of natural beauty you can find anywhere, as jaw-dropping in its way as the Grand Canyon or Mount Everest or the Great Barrier Reef.